Abu Dhabi: When Abu Dhabi announced it would delay establishing local branches of the Louvre and Guggenheim museums, it was an important signal of the emirate's economic strategy as well as its cultural priorities. "Due to the immense magnitude of the work associated with the development of such consequential projects, the company has decided to extend the delivery dates," government-owned Tourism Development and Investment Co said last month. The company gave no new dates for opening the museums, which were originally scheduled to start operating between 2013 and 2014 as part of a $27 billion (Dh99 billion) art and culture development on Abu Dhabi's Saadiyat Island. But the message was clear: getting the projects right and ensuring public demand for them would be given precedence over rushing them out quickly to gain prestige. Across the emirate, which accounts for more than half of the UAE's economy, government-backed real estate, commercial and tourism projects — many conceived during the boom years of 2003-2008 — are under review and in some cases being delayed or put on hold. This is happening under economic pressure; large parts of the real estate market are weak, and the shaky state of the global economy threatens demand for Abu Dhabi's property and tourism. Average residential property prices in the emirate sank seven per cent in the third quarter this year, and are down 49 per cent from their peak in 2008, said Jones Lang LaSalle. But Abu Dhabi has plenty of money to continue promoting projects; it is merely shifting its priorities away from some high-end developments for which demand has weakened and towards housing and welfare projects for the mass of its citizens. Abu Dhabi originally wanted to do too much, too soon and has now realised that strategy is not feasible, said Abdul Khaleq Abdullah, professor of political science at Emirates University. "A review of what is going on is very positive; it is timely and it is a matter of being more prudent. Slow is good, slow is beautiful," he said. 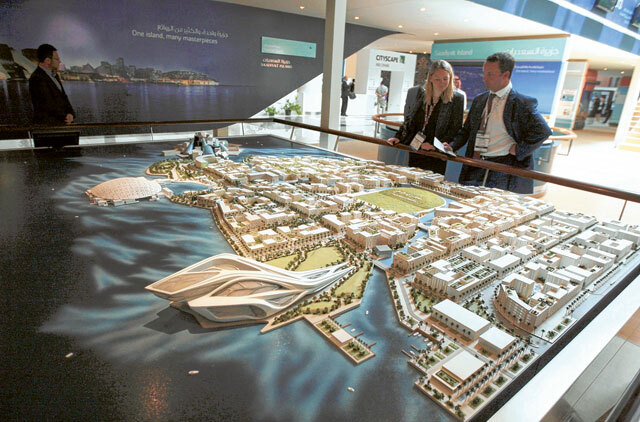 Abu Dhabi's government-owned investment fund, Mubadala, is reviewing its multibillion dollar Mina Zayed Waterfront project, whose centrepiece was to be the MGM Grand Abu Dhabi, comprising hotels and an entertainment complex. Mubadala first announced the project in 2007, and in 2008 formed a joint venture with MGM Mirage Hospitality to develop it. Late last year, Mubadala put on hold planned construction of a stadium in Abu Dhabi with capacity for some 50,000 people, citing "proprietary decisions of the government".